Controlling my intrusion detection system (alarm) via Powershell! 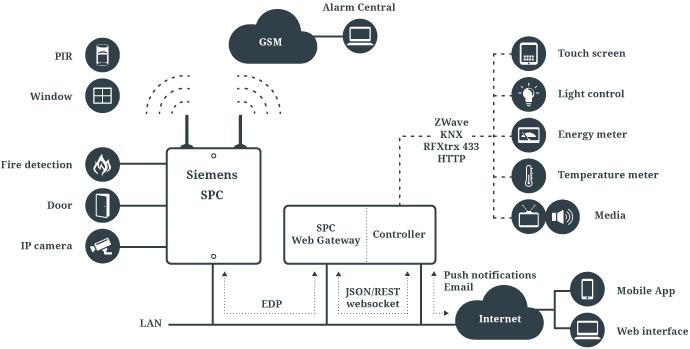 I’ve recently invested in a alarm for my house, after quite a lot of research i finally went for Siemens SPC 5320 for all the cool features, it feels like one of the most modern alarms out there. As it can be controlled from the web, smartphone applications for iphone and android, usb, ethernet (ip) etc etc. It’s more of a high-risk enterprise alarm, than a residence alarm as it got Grade 3 (and can have up to Grade 5) classification, making it usable for Banks and other high-risk objects, or to protect my geek lair (man-cave), son’s hideout, my wife’s gym, bedroom, the kitchen and other areas, also known as our home. Another reason I bought that specific alarm is that a Swedish company called Lundix has recently released a Gateway that can talk with the Alarm and connect it to other systems. Or just execute things when specific triggers happen in the alarm. Like send a mail (to specific persons) when the Alarm goes off, or maybe notice the parents when a specific person arms or unarms the alarm, ie leaves and gets home from school. Next step is to add it to the new-user-creation workflow. So when a new user is created in AD, it will also create a user in the Alarm, generate a random PIN code and include that information in the Welcome Mail and SMS sent to new users. Or possibly initiate a company wide erase of confidential data, in case of a Alarm. Anyone who can see that going wrong and causing problems? Especially as I saw some figures stating that more than 90% of all Alarms are false due to user error or indicator faults. Well, I’ve just started playing around with it and if there is interest I’ll keep you posted on my progress and different automation scenarios i setup. Hmm I think it should be possible, as it’s just “rest-api” which if I recall correctly Vera does support. Do you know if it is possible to connect SPC web gateway to Vera 3?